Although Father’s Day isn’t until next month (June 19), it’s never too early to plan that special gift for that special Dad in your life. Make it a great holiday by choosing from an incredible list of travel adventures. Forget about the lame tie, give dad something he will remember the rest of his life. There are many travel adventures available no matter what his tastes are. Does your father like to golf, hike, swim, or cycle? Does he enjoy ancient history or the beauty of nature? Give him an adventure that maybe he’s dreamed of doing his whole life. Show your Dad love and make it a VIP experience of a lifetime! Of course there are many travel adventures to pick. Many sound great at first, but a little research determines there’s not much “meat on the bone.” We wanted to share with our readers 8 travel adventures that will a big hit with dad. No we’re not talking about taking him to a baseball game either. These are over-the-top travel adventures to die for. There’s dog sledding in Siberia, hiking Machu Picchu, brewery hopping in Belgium and even fly fishing in Bolivia. Here we go …. This amazing experience is ideal for your daring Dad who has seen it all. Your father can race teams of sled dogs UNESCO-listed Lake Baikal. He’ll also ice-fish and glide across the lake by hovercraft. He will discover one of Siberia’s Buddhist monasteries in the city of Ust-Ordynski, Participate in a sunrise shaman ceremony at Shaman Rock, which is best-known spot on Olkhon Island. Your dear Dad will be able to access the most iconic site of the Incan Empire – Machu Picchu. Your trip will be led by experienced tour guides. Learn about the history of the mighty Incan Empire. You’ll be able to wander the winding streets of Cusco. This is an incredible trip to Peru. 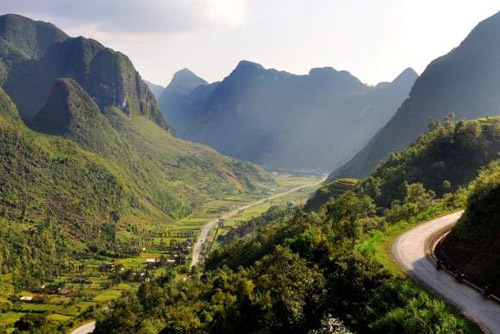 Adventure to the remote region of Ha Giang. This area is located in the north-eastern corner of Vietnam and consists of primary forests and rice paddies. Jump on your bike and ride up through vertiginous passes to view incredible scenery. This is an amazing cultural trip that should not be missed from Ride & Seek. Many travelers don’t get the chance to take advantage of an inaugural trip. Now you can. Your father can take part in the “Roping and Ranch Skills” retreat. This experience will be five days long and your Dad will learning various roping fundamentals and cattle work techniques. Feel what it was like back in the Old West and be taught western horsemanship from expert horse trainers, wranglers and riding instructors. This western retreat will be held at the luxury Red Reflet Ranch. There will be numerous ranch activities, plus wine tastings. Dine in style with ranch-to-table haute cuisine. Fly fishing for Golden Dorado is a treat for many anglers. Now your father can fish in the Amazon for the mighty fish. At the point the Amazon River meets the Andean hardwoods, fly fish in a remote freestone stream. This package is four nights and he’ll stay in a lodge near Chimán Indian village. Fishing the nearby rivers and try your luck catching two different Dorado species, in addition to other fish from the Amazon basin. Maybe you can catch an Amazon Pacu, Pirapitinga or even the the Yatorana. If your Dad loves drinking beer and cycling, we have the trip for you! Having the chance to travel to Europe and cycle in Belgium is a terrific experience. Belgium offers beer lovers more than 1,130 brewed beers to choose from. This unique cycling tour allows you to visit more boutique breweries than other, available European bicycle tours. Don’t settle for second best. What a perfect getaway. Explore the magnificent Galapagos Islands. Enjoy the natural beauty of this iconic location with a variety of outdoor activities. Dad can try biking, hiking, kayaking, snorkeling, plus seeing stunning wildlife up close! He’ll be able to paddle with sea lions, turtles, dolphins, view a wide variety of native birds. Give your Dad that special gift for father’s Day. Travel Adventures are an amazing experience and we can help plan and book for travel itinerary. Travel the world in luxury style. Return soon to follow this luxury blog. Read more travel industry articles on unique opportunities.